AD: How to import ai and eps brushes? Affinity community, I need your help! I'm fairly new to Affinity Designer and I'd like to use some brushes which are available throughout the web. While I have no problems importing afbrushes, it seems to be impossible to do the same with ai and eps. I could not find any working solution both in the Affinity help and the forum. Let me illustrate the problem with an example. I got a pack of brushes at this website and unzipped it on my MacBook. In AD, I tried to import the brushes, like always, by navigating to the brushes panel and clicking import brushes. If I click the button, I can move to the unzipped folder where I eventually see ai as well as eps brushes. But as you can see in the screenshot, the respective brushes are greyed out—no matter if in draw or pixel persona. 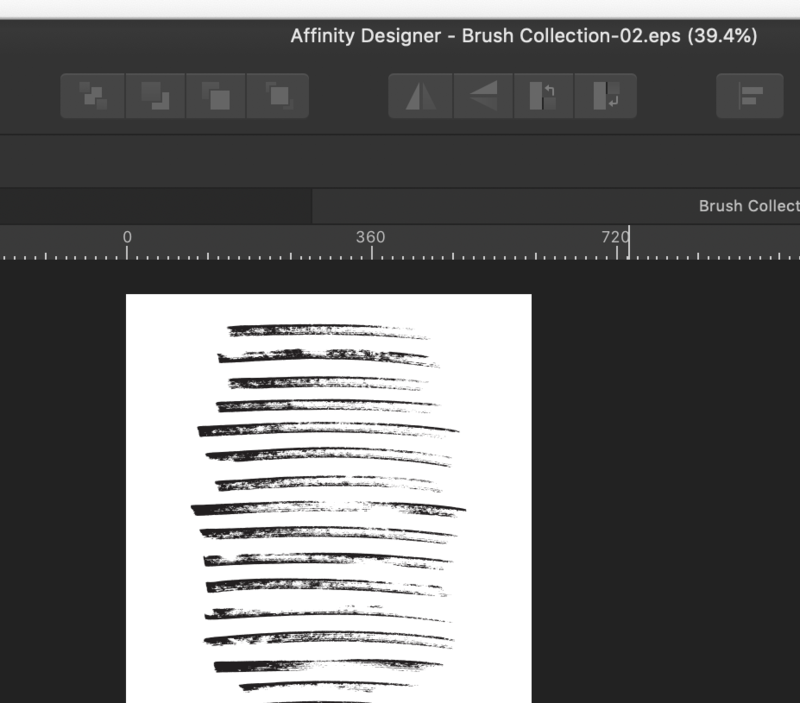 On this page, Affinity says that one would be able to import both brushes. And if I open an eps brush by right clicking open with, AD opens them as you can see in the second screenshot. But then, I don't no what to do to use them as brushes. So I would be very happy, if you could help me to solve my problem/confusion. Besides the aforementioned problem: AD rocks! @Mensch Mesch, weißt du was? On this page, Affi﻿nity says that one would be able to import both brushes. That Help page just says that you can import/export EPS files. It does not say that you can import them as brushes. It's possible that you can, but someone with more brush experience than I will have to say what you would have to do to create Affinity brushes from them. Sorry. Unfortunately Affinity doesn't currently support .eps or .ai brush files. These are also known as 'true vector' brushes and have been requested previously on our forums. We hope to include support for these in the future, but we have no eta for this currently, my apologies. @Dan C, thanks for your clarification, anyways. I'd really love if you could include this function in the near future. There's so much wonderful stuff out there. wie von den anderen schon beschrieben kannst du bislang noch keine ai oder eps Pinsel importieren. Wenn du die eps jedoch öffnest kannst du natürlich selbst daraus neue Pinsel über den herkömmlichen Weg (Export als png) erstellen. Leider muss du dann natürlich sämtliche Einstellungen für die Pinsel selbst vornehmen. Danke dir. Das probiere ich mal aus.